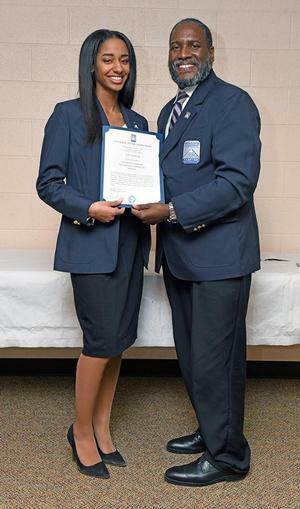 HAMPTON, Va. (February 8, 2019) - Hampton University’s William R. Harvey Leadership Institute (WRHLI) hosted their annual leadership induction ceremony on Thursday, January 24, 2019, in the McGrew Towers Conference Center. A total of thirty freshmen students were inducted into the 2018-2019 class. Hampton University alumnus, DeWarren K. Langley (’07), was the guest speaker for the ceremony. DeWarren K. Langley earned his Bachelor of Science in Business Management and Economics with a minor in Leadership Studies from Hampton University in 2007. He is an equity minded community leader, student success coach, career development specialist, policy analyst and strategy consultant. During his address, Langley motivated students to become the best leader they can be. “Leadership is not always glamorous. You will not always be recognized for the hard work you do. It can be lonely and frustrating, but it is necessary. As you all embark on your journeys and pathways, people will try to get you to sell yourself short. Think back to what you’ve learned as Fellows and the discussions you’ve heard at Hampton University. 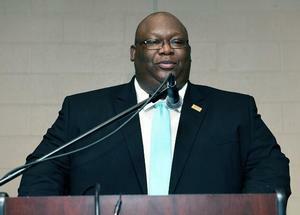 Remain humble and focused on what your mission is to contribute to society,” said Langley. Upperclassmen Leadership Fellows were in attendance for the ceremony, encouraging and applauding the new inductees as they were welcomed into the institution. “Watching our last induction was bittersweet. We are so happy to see these freshmen become a part of our family of leaders. We thought back to our induction and realized how much we’ve grown and progressed. 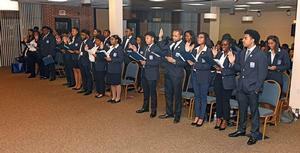 This day symbolizes growth,” said Victoria Daniels, fourth-year student in the WRHLI.